Fully refurbished and styled to a beautiful high standard, the Townhouses offer you the option to stay together with friends or family in your very own private Lakeland residence. Built at the turn of the century in the vernacular slate architecture, the Townhouses are warm and welcoming yet stylish, light and spacious. The houses are tastefully stocked to make your stay in the Lake District a pleasure. Many period features are retained and sympathetically restored, including original floor tiles, fireplaces and ceiling coving. Each bedroom boasts a new luxury mattress, ethically crafted in the UK and dressed in high quality linens. Black out blinds are fitted for those with light sensitivity. Kitchens are well stocked to ensure that the pleasure of eating out can be recreated at home. Essentials such as new cutlery, utensils, cookware and appliances are paired with indulgent little extras such as a new espresso machine and a selection of espresso pods. Cole and Lewis bathroom toiletries are offered in the bath and shower rooms, together with fresh towels. Living areas are kept cosy with a real log burning stove to complement the new central heating enjoyed throughout. A flat screen smart TV permits access to Netflix, Now TV, Amazon Prime (please bring your subscription details to log in to these services) as well as a DVD player and normal TV channels. High specification wifi is provided throughout for your convenience and connectivity to home, essential in this mountainous region of notoriously poor signal. Each house has its own private outdoor area, with seating to enjoy a meal or a glass of wine at the end of the day. The restaurants, wine bars, supermarkets and other diversions of Keswick are only a moment’s walk away yet the quietude of the fells can be experienced in under an hour’s walk or a few minutes drive. Windows open onto views of Skiddaw and Latrigg to the north and to Catbells over the rooftops of Keswick to the south. Please note the Townhouses are not available for hen or stag events. Number Three The Townhouses offers spacious accommodation for up to eight adults, in three double or king bedrooms and one twin bedroom, set over three floors of accommodation. One bedroom is at ground floor level for those who prefer to avoid stairs. Number Five The Townhouses accommodates up to eight adults, in three double or king bedrooms and one twin bedroom, over three floors of bright, freshly renovated accommodation. Number Seven The Townhouses accommodates 8 adults comfortably in four tastefully styled bedrooms, three double or king and one twin. Number Nine The Townhouses offers extensive accommodation for up to ten adults in four double or king bedrooms and one twin bedroom. Two bedrooms boast their own private shower facilities in contemporary style. A further freshly styled bathroom is provided. One twin bedroom is located at ground floor level for those who prefer to avoid stairs, which may be presented as a super king if preferred. Alban Rise is a spacious modern three bedroom property set over two floors with rooftop views of the Keswick fells, including the Skiddaw mountain range and Catbells to the front and Walla Crag to the rear. Conveniently situated right in the centre of Keswick, a stone's throw from Booths supermarket and the bus station, it is ideal for families or small groups seeking to enjoy the comfort of high quality accommodation in the heart of the busy market town with everything that Keswick has to offer. Inside Alban Rise, the large lounge boasts a comfortable window seat from which both the busy Keswick town centre and beautiful mountain top views can be enjoyed. There is WIFI throughout, and smart TV, DVD player, and IPod docking station in the lounge. The three bedrooms are all on the second floor. The master bedroom has a king sized bed, there is a second double bedroom, with a small double bed and a roomy twin bedroom. Bed linen and towels are provided. The family bathroom is on the second floor with bath and shower mixer. The downstairs shower room has a shower, WC and wash hand basin. The property is double glazed and has gas fired central heating so is warm and cozy in the winter months. There is a private parking space to the rear of the property. Access is via a staircase (at the rear of the building) which leads to the entrance door on the first floor. Abacourt Cottage is a traditional Slate fronted Lakeland cottage with wonderful views across the rooftops towards the fells from the roof terrace. This well-appointed home from home is very comfortable with excellent facilities. Right on the doorstep of the town centre so easy access to shops, restaurants, cafes, pubs, swimming pool, cinema etc. Private parking space to the rear of the property and parking permit for adjacent car park. Smart t.v., Wi-Fi & Free landline calls are included in the rental. The cottage is double glazed and has remote controlled gas central heating throughout. At the front of the cottage there is a small area with slate chips and potted shrubs. As you enter the cottage you will appreciate the spacious, well furnished open plan lounge. The lounge has two two seater sofas. There is a traditional Lakeland slate and mineral fireplace with an electric stove, ideal for cosy nights in. An HD smart TV, DVD player, CD player & ipod dock are provided. Wi-Fi is available throughout the cottage. The dining area has an oak dining table and six chairs and pine dresser. This room is well lit and very comfortable. To the back of the cottage is the kitchen which is compact but very well equipped. Facilities include gas oven and hob, dishwasher, fridge with a small freezing compartment, microwave and all equipment needed for your holiday. From the kitchen there is a small porch with a washing machine and clothes dryer. On the first floor there are two good sized bedrooms. The twin bedroom has two single beds, oak furniture and looks out to the front towards the town. A wall mounted HD smart TV and DVD player is provided. 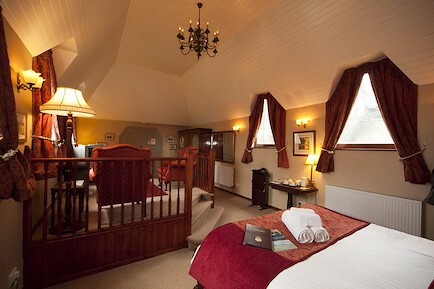 The second bedroom is a single room with views towards Latrigg and Skiddaw. On this floor is the bathroom which is fully tiled and very nicely finished and has bath with power shower over, WC and wash basin. One bath and one hand towel per person is provided. The master bedroom is on the second floor. This is a large room with beams and sloping ceilings and has fabulous views from both windows. The room itself is very nicely furnished with double bed, quality oak furniture but with the added benefit of two wicker chairs, a small table and a compact HD smart TV and DVD player - a room to escape from other members of the party! From the master bedroom there is access over the windowsill to the roof terrace where there is a table and 5 chairs and some potted plants. There is sun on this terrace all day and the views over the rooftops to the fells are stunning and constantly changing. Free Wi-Fi & landline phone-calls are included in the rental. Your enquiry will be sent directly to The Town Houses, Alban Rise & Abacourt Cottage. Please fill in as much detail as you can.